New version 4.8 ready for download, Conversation view, Hashtags, Themes, and more! 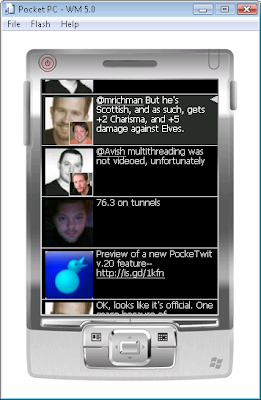 PockeTwit is a twitter client for the Windows Mobile Professional (Pocket PC) platform. - A unique user interface. - Display public, user, and friends timelines. - URL shortining with is.gd. - Clickable @names and URLs. - Option to check for new version on startup.